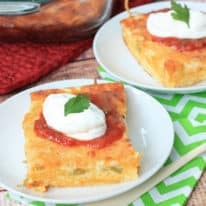 This Chile Relleno Casserole is so cheesy and so good! 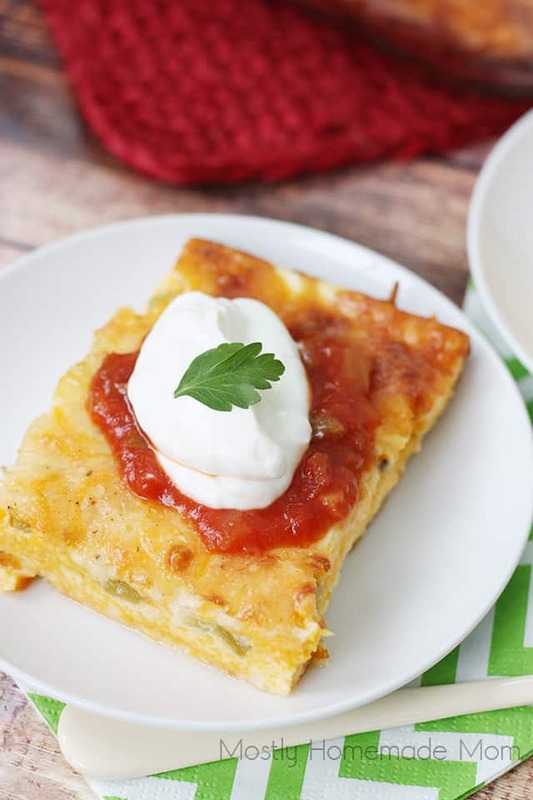 Fill with green chilis, Monterey Jack and cheddar cheeses, and topped with sour cream and salsa – put this dinner on your menu plan! Traditional Mexican chile relleno, or chile rellenos, is a chili pepper stuffed with cheese and then typically battered and deep fried. Definitely not the healthiest Mexican dish, but absolutely delicious! I love the combination of heat from the chili pepper with melty cheese and cool sour cream! Making chile rellenos in casserole form is the best way to enjoy this delicious dinner. You also get to avoid all the added fat from deep frying. Even though I totally plan on trying the traditional version ASAP! 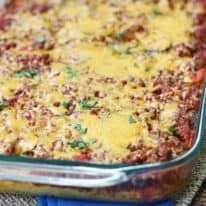 One batch of this Chile Relleno Casserole make a large casserole dish, plenty for a family dinner. I paired servings of this casserole with just a quick mixed salad to cleanse the palate, but you could also make a batch of mexican rice and beans. I think that would go so good with the cheesy flavor! 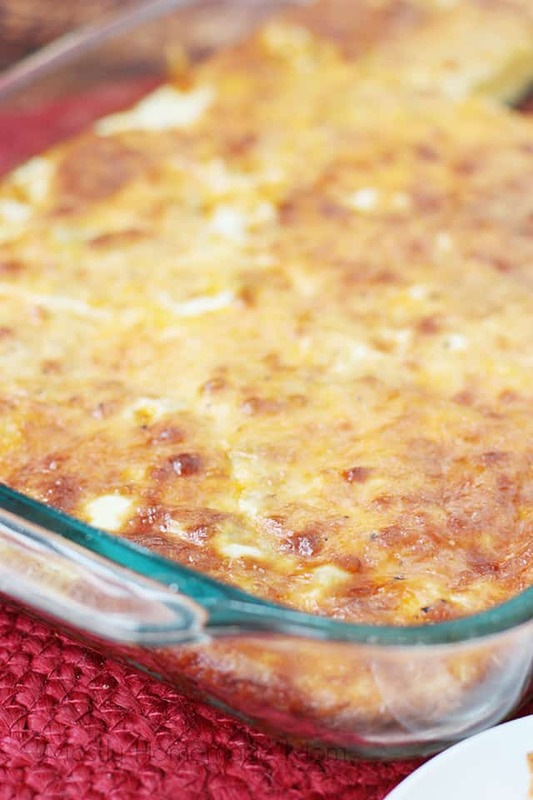 This Chile Relleno Casserole is so cheesy and so good! 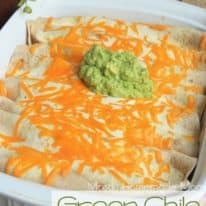 Fill with green chilis, Monterey Jack and cheddar cheeses, and topped with sour cream and salsa - put this dinner on your menu plan! Pat whole chiles dry, split along one side length-wise, and lay them skin side down in a greased 9 x 13 baking dish. Sprinkle half of both cheese over the chiles. Spread chopped chiles over the cheese. Sprinkle remaining cheeses over the chopped chiles. In a medium bowl, whisk together eggs and evaporated milk. Pour over ingredients in baking dish. Top with fresh cracked salt and pepper. Bake at 350 degrees for 45 minutes. 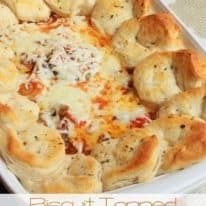 Allow casserole to cool 10 minutes. Serve slices topped with salsa, sour cream, and sprigs of cilantro if desired. 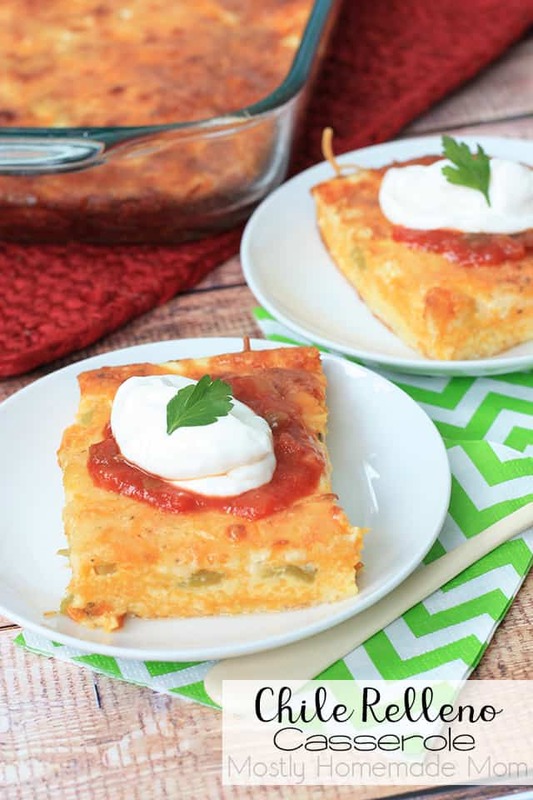 Save this Chile Relleno Casserole recipe to your “Meatless Recipes” Pinterest board! And let’s be friends on Pinterest! I love pinning tasty recipes and menu ideas! Subscribe to email updates for free family-friendly recipes. I'm Kelly. Wife, mom of three, coffee addict, & crockpot obsessed! Join me as I share my favorite shortcut recipes right here! Hello! I’m Kelly. Wife, mom of three, coffee addict & crockpot obsessed! Join me as I share my favorite shortcut recipes right here! Site CreditsDesigned by Melissa Rose Design.Developed by Once Coupled.Logo by Smitten Designs.